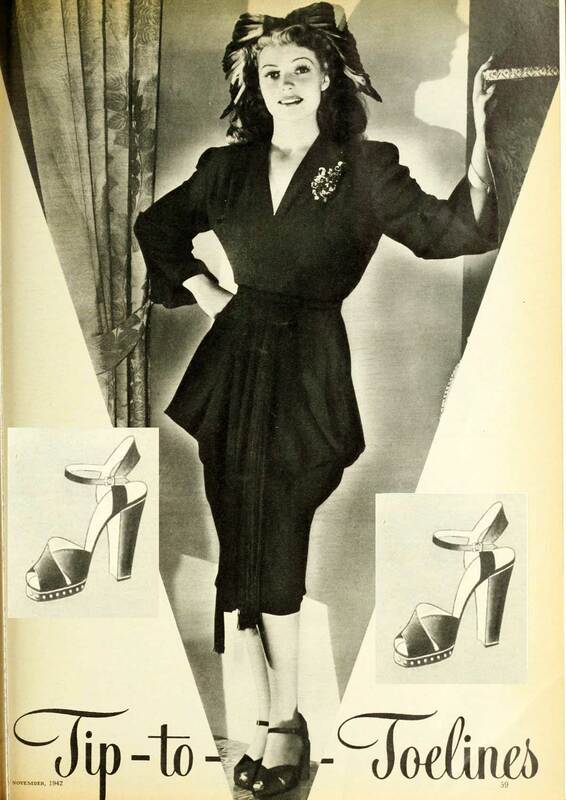 Our time traveling fashion correspondent Gwenn Walters reports for Glamourdaze from December 1942 to reveal what 1940s fashions the dishy Rita Hayworth was wearing. ” Doesn’t Rita look smart in this new winter wonder-worker – a smooth black dress featuring the new ‘peg-top drape’ and a high style belt of black cord with a rich black fringe tassel. Rita’s hat is a vivid fuchsia, darker tipped at the feather edges. Rita wears a Paris Fashion Shoe for furlough fun. Black suede platform sandal with tank heel. 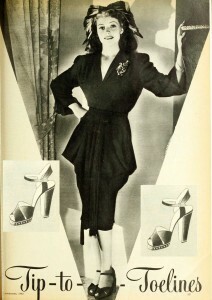 Above – this go-everywhere winner of magpie blue wool worn by Rita Hayworth would give an autumn girl ideas. It has a modified ‘peg-top drape’; the neck is trimmed with a single twist of self material and two rows of the twist accent the shoulder broadness, The self belt has a clever gold trim! Rita’s pumps are a real Paris fashion shoe for your tailored life! “Boomps Toe” spec of of military tan calf. Also in antique red or black calf, black or brown suede. 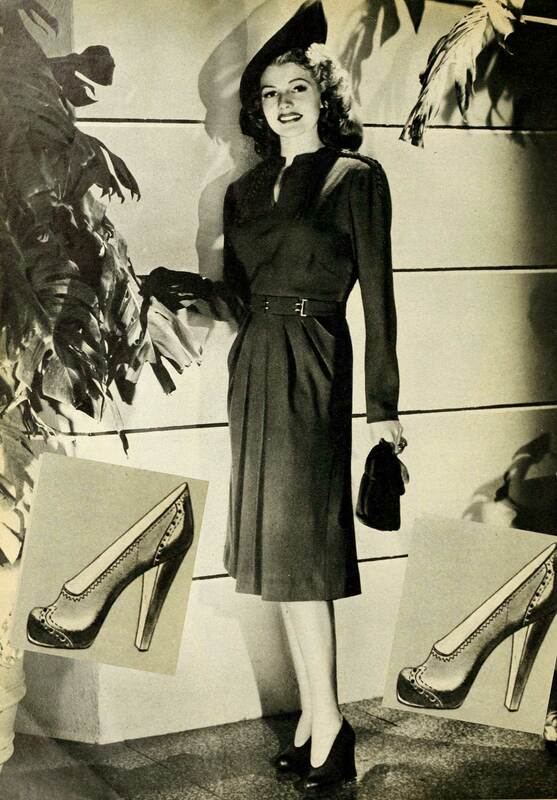 With high or midway heel! 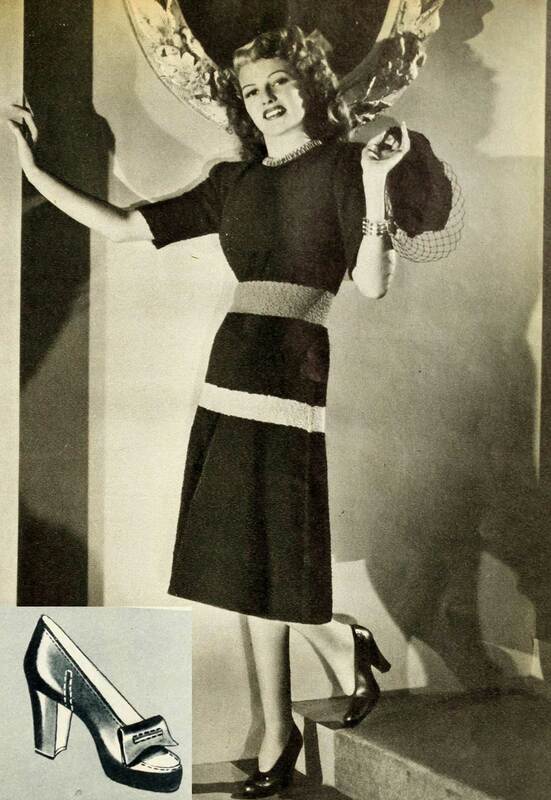 Finally – a warm tan stripe accenting the waist and a narrower stripe of sand make this chocolate brown 1940s hand-knit dress something to look at on Rita Hayworth – or anyone else. The high round neck gets a bit of effective high-lighting by a broad gold necklace that matches Rita’s bracelet. A pert little hat is knit to match, finishing things off nicely with a stiff brown veil. Ritas Paris fashion shoes have a nice smart casual look. Lo-heeler of military tan calf with flap bow, moccasin toe. Also in pine green or cherry rd calf, or in black suede.